The Friends of the Cowell Limeworks organized a second Santa Cruz County History Fair in October that was even more successful than the inaugural event a year earlier. 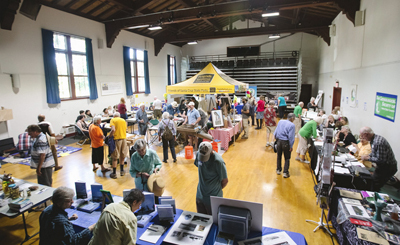 The fair was held in conjunction with the City of Santa Cruz 150th Birthday celebration and occupied most of Louden Nelson Community Center. Held on October 8, the fair was even bigger and better than the 2015 fair, with more participants and greater attendance. Many thanks to all the participating groups and to the City of Santa Cruz for their support as co-sponsor. Speakers were Gordon van Zuiden, who talked about photographer Ole Ravnos; Carey Casey, who spoke about an 1870 aerial drawing of Santa Cruz; Sierra Ryan and Katie Hansen, who talked about their forthcoming book on Santa Cruz County heritage foods; and Martin Rizzo, who discussed the status of local indigenous peoples here in Santa Cruz 150 years ago. Volunteers the day of the event were: Dennis Diego, Rick Hyman, Alisa Klaus, Don Lauritson, Jill Perry, Rainbow Mitchell-Fox, Frank Perry, Elizabeth Schilling, and Harriet Talan. We are indebted to each of these volunteers for giving up part of their Saturday to make this such a wonderful event and to the Friends board in general for support and planning. Of course, each of the over 25 participating organizations had their own volunteers who helped with setting up, staffing, and taking down their booth. The event was not only a fun and educational event for the community, it also helped the various organizations with outreach and networking. It was such a rewarding experience to have so many local history enthusiasts gathered together in one place. "I've found my people," said one volunteer with a big smile. A representative of our organization has met with some of the participating groups to see about planning another History Fair, perhaps in 2018.